We recently had the chance to review the Kyocera 6-Piece Easy Slice/Grate Set. "Kyocera’s handy six-piece set equips you with everything you need for a variety of slicing and grating tasks. The three color-coded tools are ideal for using over bowls, plates, or the container for quick jobs. They're also designed to fit securely on top of the container lid, which doubles as a vessel for collecting and measuring food. Perfect for cabbage, carrots, cucumber, onions, potatoes, daikon, ginger, hard cheese and more. I loved the julienne blade and the mandolin blade. Our test subject was a bell pepper, but we've also used this tool on carrots, onions, squash and cucumber. The julienne blade is great for creating perfectly sized salad toppings. I love that the mandolin has different settings so that you can change up the thickness of your cut depending on your recipe. It would be great for slicing up potatoes to make a healthy version of chips! The set fits nicely back together in one piece which makes for super slim and easy storage. This Slice/Grate Set is a wonderful multi-purpose kitchen tool that any foodie would love this holiday season! ABCD Diaries gives the Kyocera Easy Slice/Grate Set an A+! Check out all of the great kitchen tools at Kyocera! 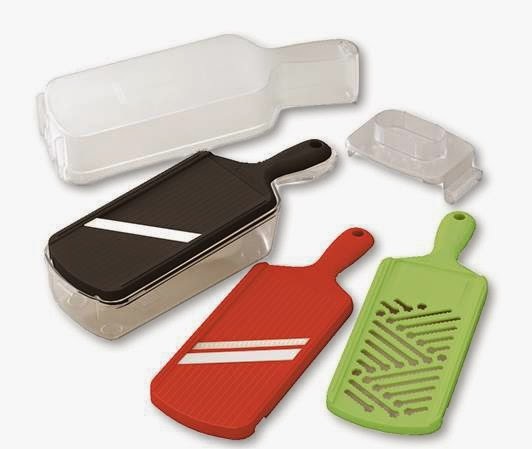 One lucky winner will receive the 6 piece Easy Slice/Grate Set from Kyocera, a $60 ARV! I would use this to grate cheese for lasagna. I would use it to slice veggies for a stir fry. Id use it to grate zucchini for these tots my kids love! I would use this to grate and chop the veggies when I make homemade cole slaw. I would use it for cheese more than anything else. I make a lot of salads year round so this would be a huge help. I'd use it for a ton of things, but I can see shredding some carrots for soups and stir-frys! I would use it for onions, tomatoes and other veggies and cheese mainly. veggies for salads and salsa! I'd use this when I make different types of slaws. This would make things a LOT easier! I would use it to make my cucumber salad. I would make potato chips and slice cucumbers for salad. I could really use this in my kitchen! I would use it to slice a lot of vegetables that I need for a quick dinner. As there are only two of us, I really don't need the Cuisinart processor anymore. I would slice and dice all my veggies for a great vegetable soup. I would use it to grate cheese and vegetables for stir frys and salads. What would you use your Grate and Slice Tool for? cheese would be grated, along with fresh cilantro and mint since we use that in some of our cooking. I would use it for onions, tomatoes and cucumbers. I would love to use the mandolin to slice cucumbers and other veggies. I would use it to slice tomatoes, cucumbers, potatoes, other veggies and grate cheeses. I would use it for cabbage and carrots and other seasonal veggies. I would use it for stir fries. I would use it for onions. I would use it for slicing onions. I hate slicing onions by hand. I would use it to slice veggies for stir-fry. I'd use it for hash browns, latkes, carrot cake, & cheese. I would use this to grate cheese and slice vegetables. I could fine many was to use cheese vegetables fruits. Cheese and veggies!! This would be a great needed addition to my kitchen!! I would use it to slice cucumber for fresh summer salad! I would use it to slice up veggies for salads! I would use it to slice veggies! Veggies because I hate chopping them sometimes. I'd use this fabulous tool for all sorts of vegetables, for salads and soups and all kinds of other things, and I'd use it for cheese and chocolate and who knows what else! I would use it to make lovely thin vegetable slices. I'd use it for french fires among other things. I'd use it for potatoes! I would use this to slice and shred up cheese. I'd like to make healthy baked veggie fries or snacks. I would use it for some carrot cake! I want to make kettle cooked potato chips. I love chopped/sliced salads so I would use this to make my lunches for work. I would use it to slice cheese and veggies! I would mostly use it to prep veggies for salads and stir fry. I would use it to grate cheese and chop cabbage for salads.